Mommy, what do you do all day? How a stuffed lamb helped me become a happier working mom. A question I imagine many working moms get, but struggle to answer. I had this problem too, until one stuffed lamb helped me to become a happier working mom. I have “Lambie” to thank for helping my kids understand, and even become a part of, my work-life. I’ve noticed that as a result, I don’t suffer with as many of the divided loyalties that plague working parents. It doesn’t mean my kids are happy when I miss important activities, or I am away on business, but because of their understanding of what I do they’ve become invested in my success. One day when my oldest daughter was four, I was leaving for a business trip to Washington, DC. Before I left, she had added a little something to my suitcase. When I unpacked I found a one of her stuffies staring back up at me. I decided to take photos of my new friend alongside me during my many business trip “adventures”. Drinking Starbucks, having meetings, sleeping in hotels, and of course riding in Ubers. Over the past five years, a veritable Noah’s Ark of animals have accompanied me on trips around the world. My girls love the ritual of picking an animal to travel with me (only one per trip!) and getting funny pictures of their stuffies’ exploits. I love the opportunity to include them in my day-to-day experience, even when I am away. On that very first trip, I took a picture of the stuffie visiting Congress. 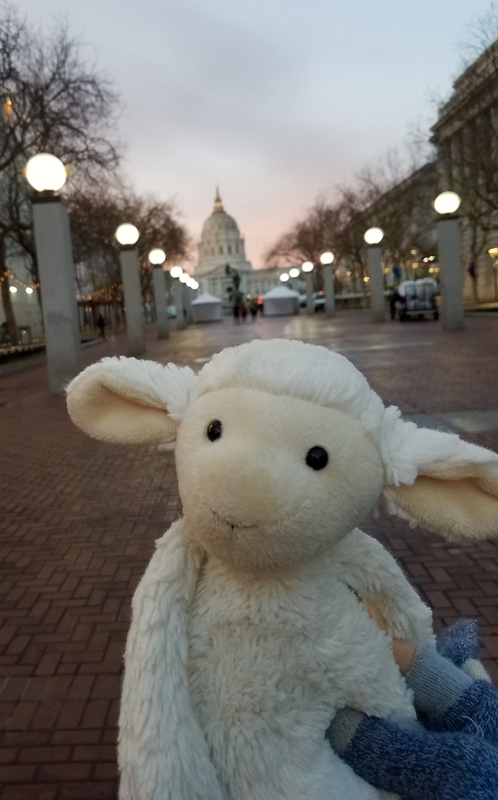 On my last trip, a fluffy stuffed lamb was my traveling companion, and “Lambie” had the opportunity to meet Uber Board Member and Thrive’s own, Arianna Huffington. Throughout my journeys I looked for photo ops for the stuffed animals, which really allowed me to realize why I enjoyed my job. I get to see new places, meet interesting people and make an impact on the world. Through the eyes of their stuffed animals, my daughters and I have been given a tool to keep in touch, and an unexpected lens into what it means to have satisfying work. I also get to enjoy bringing my daughters into the office, allowing them to meet all the interesting people I work with. “Don’t forget to tell your work friends Happy Valentine’s Day,” was the last thing my daughter said to me on Wednesday, as she headed off to school. On days off from school, they come to have lunch with me. When they have school projects, I bring them into the office on the weekend so we can work on them together. Lambie and all of our stuffed friends help my girls understand that there is more to my work than just the “thing” that takes me away from them. It is a three dimensional reality, filled with people, experiences and opportunities to thrive (if you will) that they are a part of. I have a feeling Lambie will be getting a promotion this year, she has certainly earned it. Shari Shapiro is Uber’s Senior Manager for Public Affairs for Pennsylvania and Delaware. Shari Shapiro leads Uber's public and government affairs in Pennsylvania and Delaware and is the mother of two daughters. In her spare time, Shari makes art and does yoga.